Some 95 defendants have packed into a court in southern Spain for the opening of one of the country's biggest-ever corruption trials. 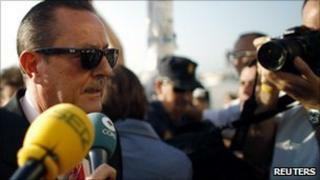 The suspects include two former mayors and the former planning chief of the resort town of Marbella. They are accused of taking bribes in return for granting planning permission in a multi-million euro scam. Marbella's council was disbanded and temporarily replaced by auditors in 2006 after the scandal was uncovered. Prosecutors have asked for a 20-year sentence for Marisol Yague, who served as mayor between 2003 and 2006. Her predecessor as mayor, Julian Munoz, faces 10 years in jail if found guilty. The former head of urban planning, Juan Antonio Roca, is accused of masterminding the operation and faces up to 30 years in jail. They have been charged with various corruption and money-laundering offences and with misusing public funds. Former town hall officials, lawyers and business representatives are also among the accused.